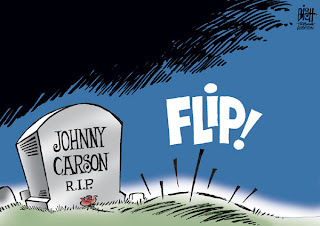 While I'm a bigger Leno fan than an O'Brien fan it sure seems Conan is getting screwed either way. Too bad there's so much ego involved on both sides because you can bet Conan isn't be turned out to pasture for nada! Don: I think the NBC suites are to blame. 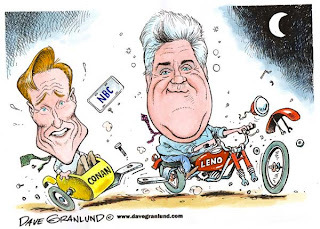 First they squeezed Leno our prematurely and settled Conan in. 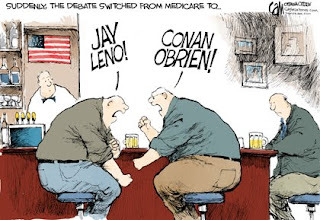 Then, they thought they were so smart to save money by using Leno at 10 instead of a prime time show. Bunch of douches. Meh, I'm a Letterman fan. If it doesn't cost much to produce the early Leno show, give it more time. Why didn't the NBC execs just ask me? Quirks: Works for me. And some times I was even able to stay up late enough to see him! 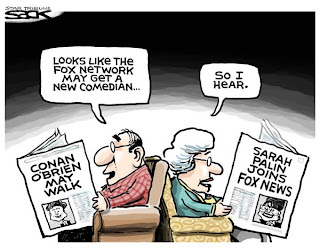 I'm neither a Leno nor an O'Brien fan.Those funnies are what got me.HA! The Peacock cartoon is so right on. I like Conan and Letterman too. 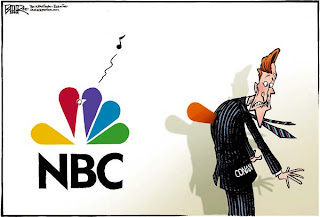 It's been a real circus this past couple weeks, though, so I'm glad it's over and Conan can wipe away his tears with the 30 million NBC is giving him to just go away. Way to go big guy! I just watch Chelsea Lately instead of Leno or Conan. No controversy about time slots or ratings there. However, I do think Conan is getting the short end of the stick, especially now that his ratings are going up ironically enough. Donna: Hey, I look for the best. Some are simply priceless. UR: There I times I still see the early, awkward Leno. Remember when he first started the Tonight Show? He was simply terrible at interviewing. Tgoette: I wouldn't be surprised if Leno's ratings dropped. Staci: Yeah I think Conan got the short end of the stick too. It was NBC execs who pushed out Leno from the Tonight Show slot and announced before he'd even left who was taking his place.